At the start of the second quarter in Saturday’s game, junior linebacker John Haggart tore through the line of scrimmage and ripped the ball out of Delaware quarterback Joe Walker’s hands. Senior defensive back Jaheem Woods recovered the ball and took it to the end zone. The play shows how far Haggart and the defensive line as a whole have improved in the absence of senior defensive lineman Aaron Thompson, who is injured. Haggart’s performance was nothing short of incredible. He had 11 tackles, 5.5 tackles for loss, three sacks and three forced fumbles, all career-highs. Before Saturday, Haggart had 5.5 tackles of loss on the entire season. Haggart was the catalyst for the team’s scoring. Two of his forced fumbles led to touchdowns in the 28-3 win. Not only did Woods return one for six points, but in the third quarter, Haggart forced a fumble in Delaware territory and on the ensuing offensive drive, redshirt sophomore quarterback Joe Carbone used the field position to scramble his way to the end zone. During the game, the Sayville native ran amok as he proved just how potent Stony Brook’s defensive line pass rush could be, especially in a season where the pass rush has mostly come from Woods and junior defensive back Tyrice Beverette. Haggart is not the only member of the defensive line that has shown tremendous improvement. Junior defensive lineman Ousmane Camara showed that he has the potential to be a lethal weapon for the line. In the past three games, Camara recovered a fumble, broke up a pass and recorded nine tackles. The effort that he puts forth is admirable, and the fact that he utilizes his length to defend the pass is underappreciated. He attacks the block so hard that it takes two offensive linemen to block Camara, which opens up holes for other defenders to pressure the quarterback. The defensive front — Haggart and Camara, along with redshirt sophomore defensive lineman Josh Valentin and junior defensive lineman Humphrey Anuh — has exceeded expectations. But the group is still living in the shadow of last year’s defensive line. The line featured Victor Ochi, who made his New York Jets debut Sunday, and was considered one of the most dominant front fours in the Football Championship Subdivision. 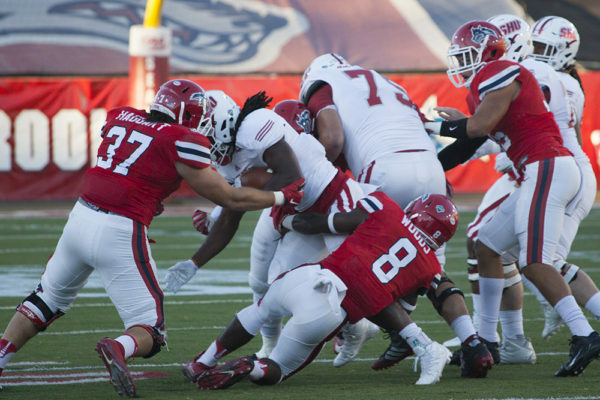 With Haggart having a phenomenal game and Camara on the cusp of excellence, Stony Brook’s defensive line is looking a lot better than it was early in the season. While Thompson was slated to be the next big-time weapon on the line, Haggart and company seem to be just fine without him.